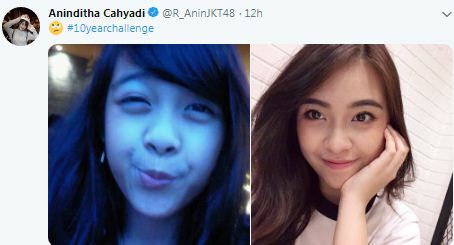 Anin often ridiculed [jokingly] by fans as “Anindut” means “Anin fat” because her twitter postings give impression that her activities beside jkt48 are only sleeping and eating. In realiti Anin is also a college student. *"Sepiring Berdua” means a porsion/dish of meal (rice) being eaten together by a love couple, an idiom which came from a title of old popular folk song. 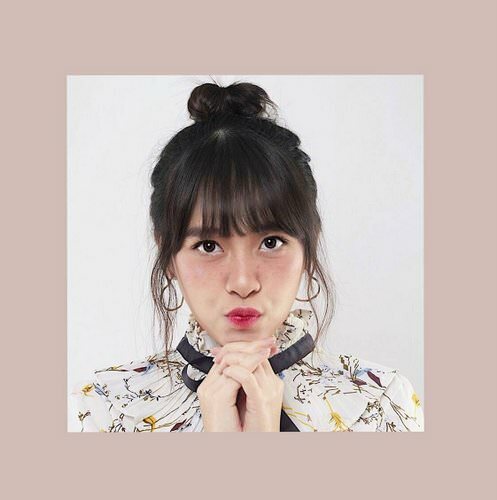 Let Dena get married but Anin is still jkt48's most wanted as wife by those wandering jones* in twitter & IG. Last night Anin appeared in my dream. She looked jolly as usual. Short moment later she shape shifted into a cheerful cat. The cat jumped around then running away disappeared in the dark of night. The dream stopped and I eventually woke up only to find my surroundings were pitched black as the electricity went off. I don’t think I have romance feeling toward Anin but it’s like my subconscious was presenting “a beautiful kind” right before waking up. Strange yet a peaceful feeling. A couple days ahead will be the full moon. Dewa19' “Kosong” is the most beautiful song for full moon while imagining myself when I was little boy playing swing in my house yard, bathed under the moon light. The idea is came from Desy. Anin and Yupi is doing an ads for caprico oh, Calpico the Japanese drink who endorses jkt48 recently. 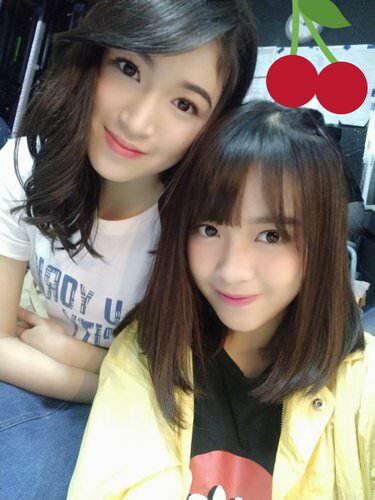 There're some siblings member in jkt and the idea making Anin-Yupi a twin I feel now could be a new thing for jkt48 after Kyla-Zara. This is for Anin. Maybe she's not fasting. The caption says Anin eats two dishes of rice altogether. 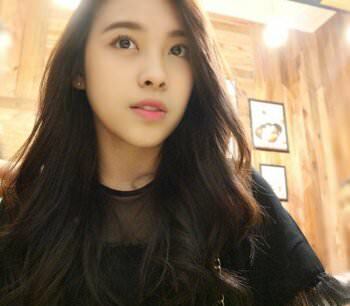 If you want to join Anin fanbase, you can get the link on Aninlicious twitter bio account twitter.com/Aninlicious . Although widely used I always refer the little chuckle "hihi" with Anin. I remember her twitter pinned post with dat 'hihi' a while ago. I forgot what she's doing in her room in the clip. 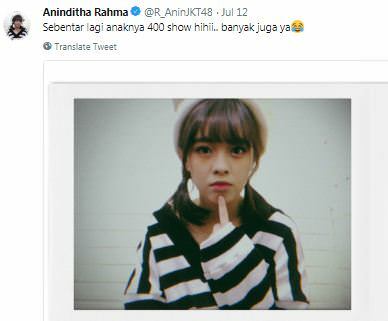 Anin says she's going to have her 400 shows. Anin's is on my fav in K3's new profile photos. K3 staff has been with creative reputation . In recent KIII twitter avas the members are with the concept I think it's classic white girl look with freckles and dress style from 1930, I guess. Dunno if it relates to setlist or particular event as charity fairies , where they put on bride plants on heads. ANIN: "If I do cosplay, what suits me?" - "I suggest you cosplaying Mikasa. Could you?" - "You suit as Sakura, Naruto’s friend. Shizuka, Chibi Marukochan suits you too as your’e cute, funny & pretty"
- "Cosplaying you as bride while me as the groom"
- "Dora, Nin. 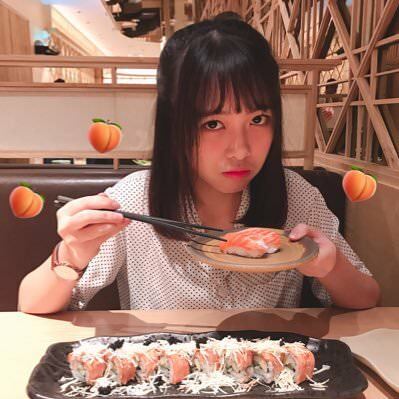 It’s funny"
There’re two guys/users always pour Anin with unique passionate affection replying her tweets. 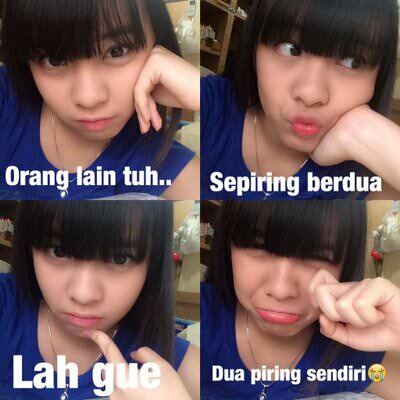 I guezz the phenomenon only happens in Anin's account among jkt members. Anin’s lucky to have them as they've been energizing her twitter. 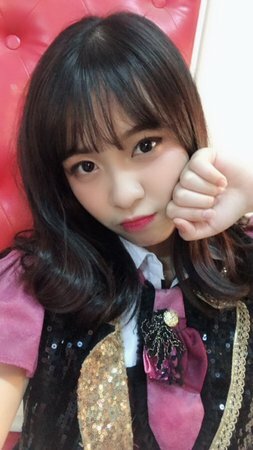 In this year sosenkyo Anin entitles her video campaign with “Secret Admirer”. 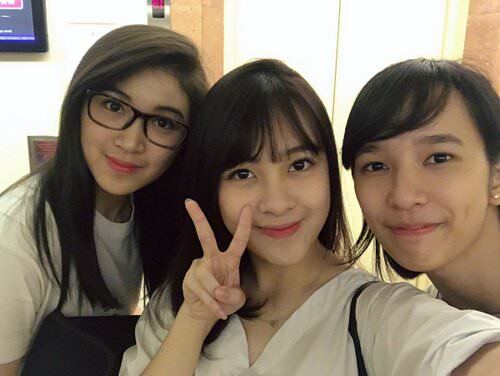 In socmed, her two phenomenal fans are still pouring their big support to Anin. It’s amazing they both are showing passionate affections tirelessly without being seem in a competition. The “el-chico” one is stick with firm to Anin and the other one apparently has been diverse which is okay to. No problem, Nin. It’s just because jkt girls, your colleagues are too irresistible. 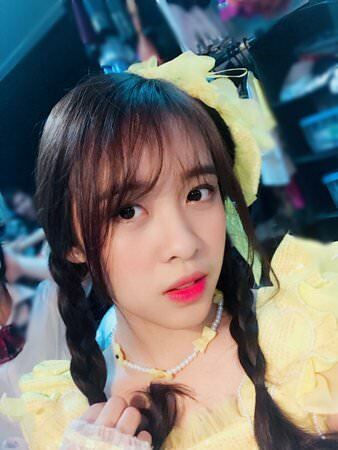 Long hair Anin is more defined Anin. I can feel Anin's magnetic was strong back then. Anin fans have been seeing the face resemblance between her and Miki Honoka, a Japanese actress who’s famous with J-Dorama "Mischievous Kiss". I remember about a month ago Anin tweeted about her surprisement that Honoka followed back her instagram account. Miki even said to Anin “If you come to Japan again, please let me know”. Anin was doing a documentary shooting in Japan with K3 team mate Shania Gracia. Anin said lately she couldn't hold her online shopping temptations. I spotted at least 3 times Anin asked fans in twitter to help her with college assignments. The smart Anin usually makes them into few effective questions. Folks with experiences would gladly tell her the answers. It’s like Anin has her own interactive Quora website. Unno we browse the best answers from the experts in the site. 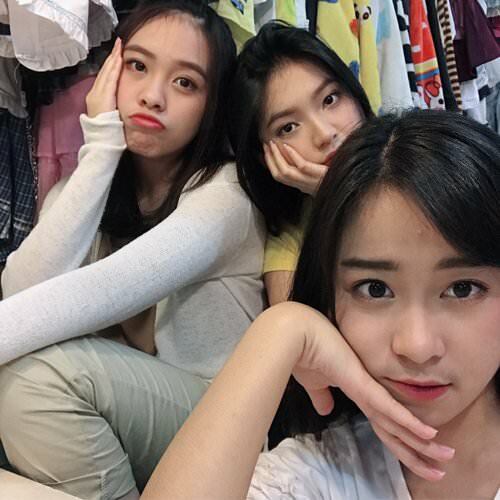 The interesting thing in jkt48 is we can also see cute girls from different ethnics background. Although the may look similar but if pay more observation they have charm in each ethnic. There're javanese [stefi], sundanese [zara], palembang [aya,anin], balinese [devi ranita], manado [gaby warouw, julie], also some arabic [nabilah], and japanese, chinese descents.The striking typical javanese face i see in stefi, diani and manado in Julie.